When I sat down to write down this recipe, I was remembering the dishes that I made for my sis during my stay at her place. 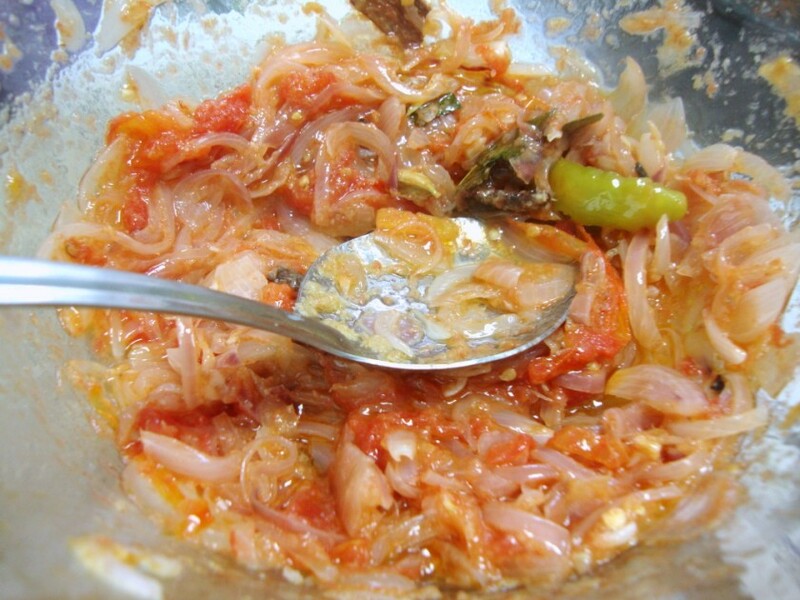 I made Uggani for breakfast. 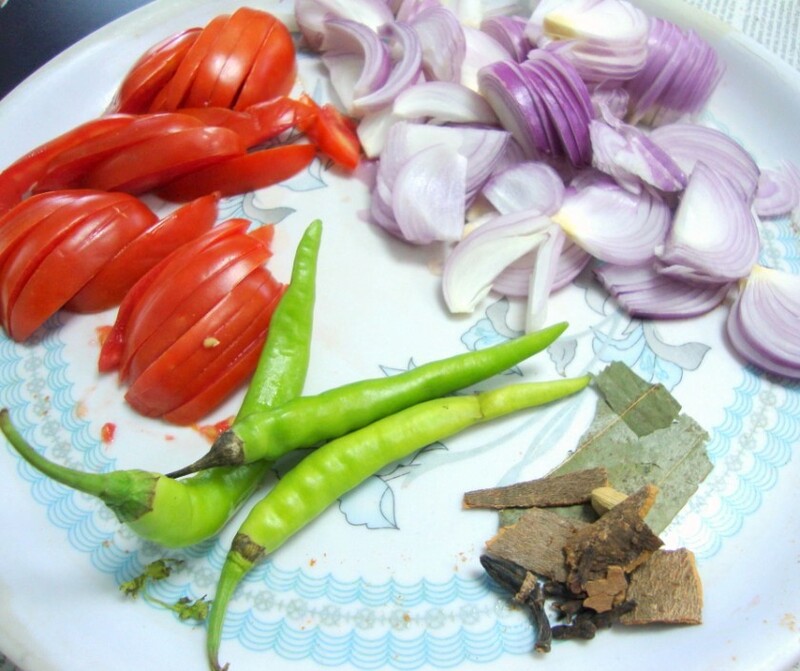 Then very late into the night, we set out making Gongura Mamsam. Imagine I had made this only couple of times, always with Athamma around. This is typically her signature dish, I was lost wondering if the leaves have to be coarse in texture or can be ground into paste (as by mistake the boiled one became into puree). Nevertheless it was consumed with great passion and adulation. It was paired with my Mutton Roast that I have planned for the cookbook I made it especially for getting another opinion for the recipe that I have created. I was elated that it got raving reviews. Then of course was this Tamarind Mix that I made for them to last for about 8-9 months. Believe me, it is really hard cooking in a new kitchen, not having all the paraphernalia you are so used to. Still we managed to filter and extract the pulp and finally got the masala mix done. Now I only hope it stays good for 8 months as I predicted. I was so happy hearing her say that her mom makes it the same way, as she learnt my Amma! I didn’t think there will come a day when I will be feeling tired to even look at the monitor. But that is exactly what has happened. Since coming back to normal grind, I have been so tired to even think of doing anything with the system. The fact that even if I don’t get to send an entry for any of the many events that are happening, I can’t ignore my own event right. It worked out easy as Smitha choose a theme which gives us many options. 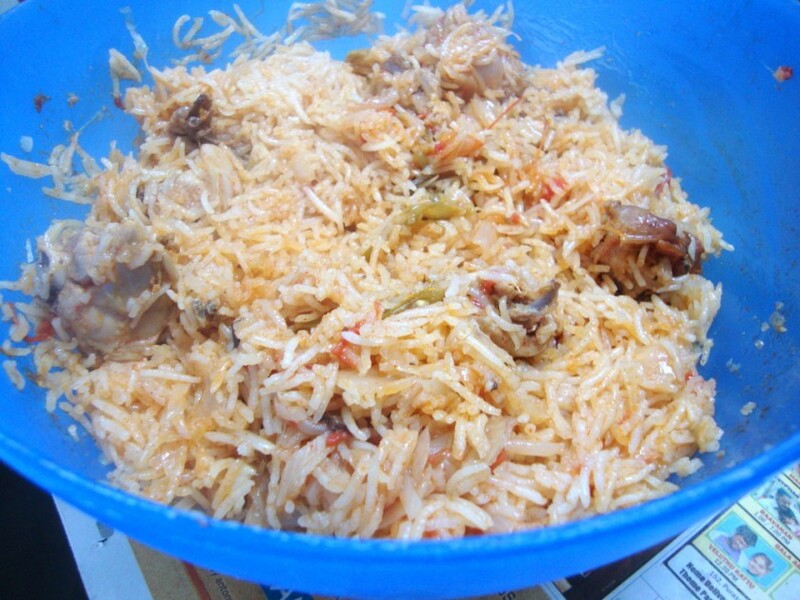 So I decided I will send her this Chicken Biryani made in Microwave. 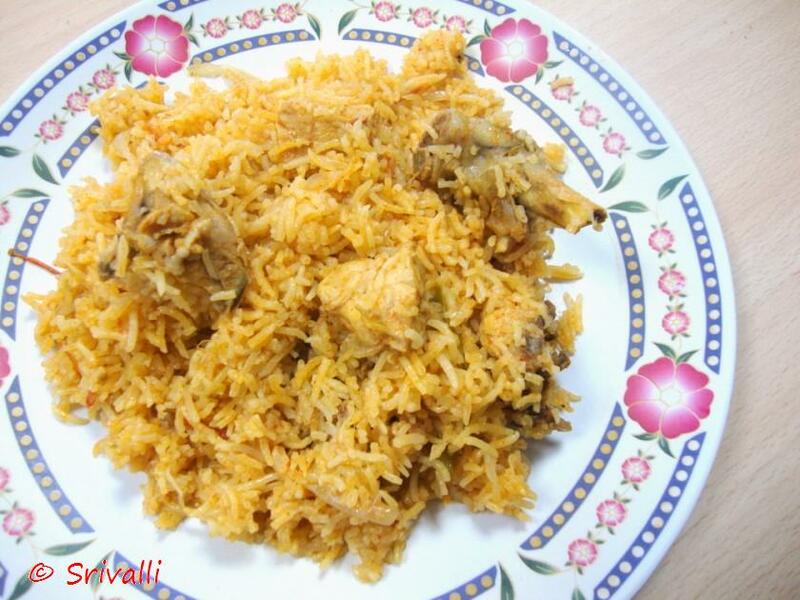 About the Title, yes there is no such thing as Low Calorie Chicken Biryani, yet this recipe calls for no butter or Ghee. But if you feel it is a taboo, pls go ahead add some for taste! This was a followup after the many recipes that the MW Chef showed us. Since I can’t taste, I didn’t know until I came back home and made it for the family that it was really good. Only I should have added ghee. 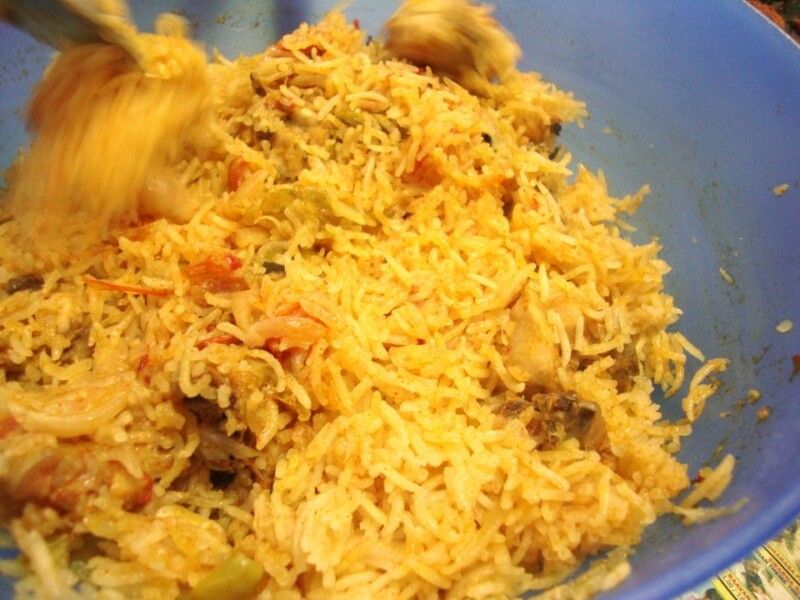 What is a Biryani if it is not rich. Well Microwave Cooking is all about Low Calorie cooking using only tad bit of oil, but I was told that Biryani is not acceptable without being rich. 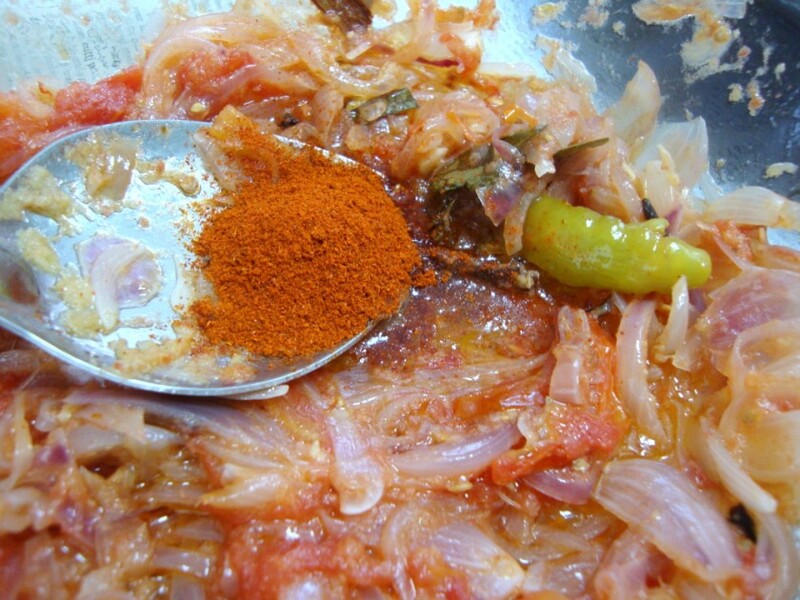 So this recipe goes without Ghee, but you can add it if you so wish. I warn you ahead, it may appear making this in microwave is more time consuming and tedious than making it on the stove top or dum process. But you get to rest and do lots of other things during the cooking process. And making it in microwave is more for folks who can’t make it on stove top! 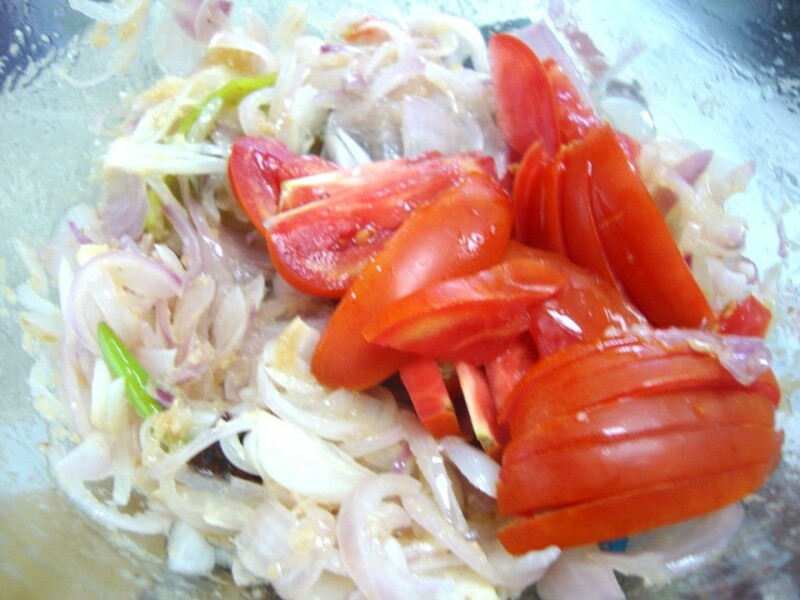 Chop the onions, tomatoes and get all the spices ready on a plate. 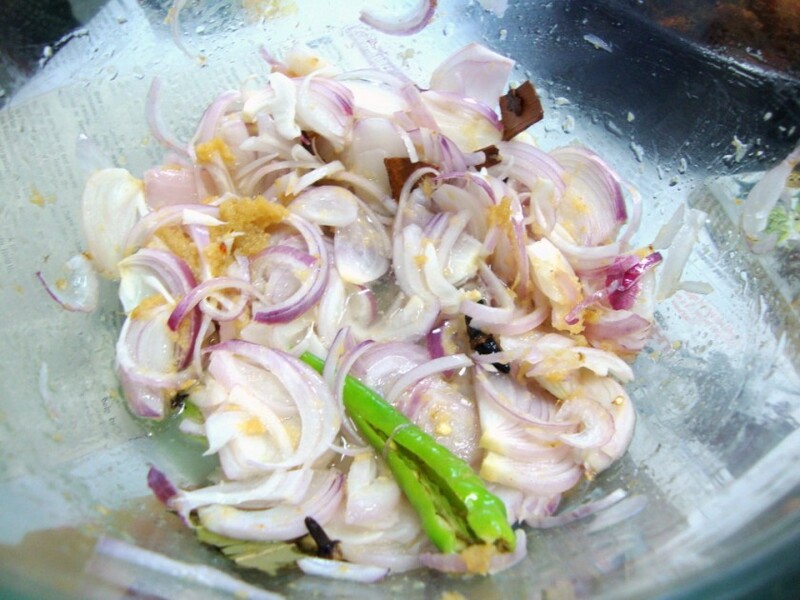 In a microwave safe bowl, add the onions, green chilies, ginger garlic paste along with spices with 2 tsp of oil. Micro for 7 mins. Then add tomatoes and micro for 5 mins. Remove and mash well using a ladle. Then goes the chicken, mix well. 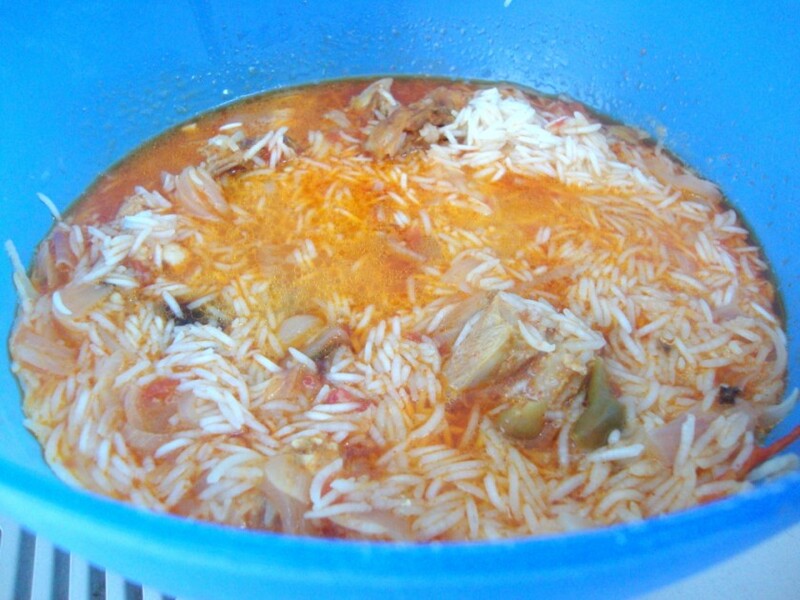 Then add the chicken mix to the rice that you have kept soaking. Add 4 cups of water and micro for 25 mins. Stir it couple of times in between. When you reach the last 5 mins, add the salt. 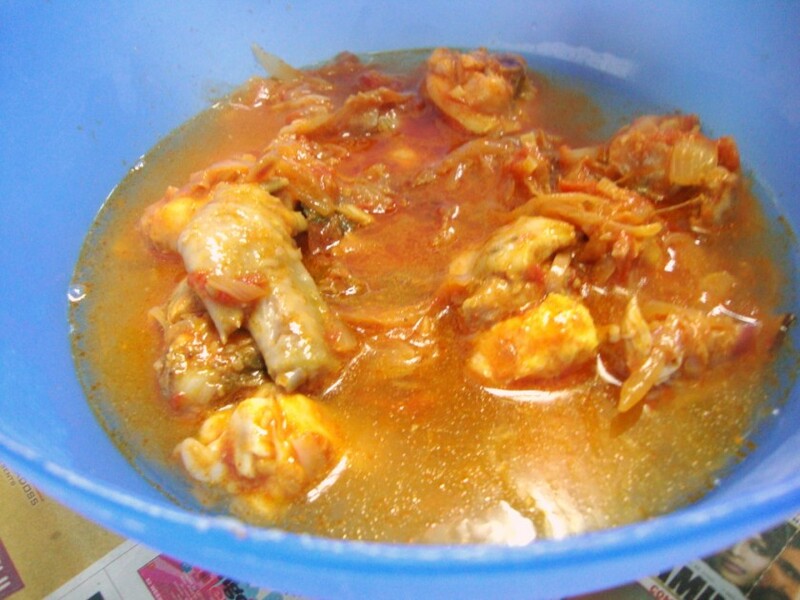 Finally when it is done, remove from oven, keep a plate covered on the bowl for 5 – 7 mins. This ensures that it gets furthered settled well. Wash Chicken and let it stand on a colander. 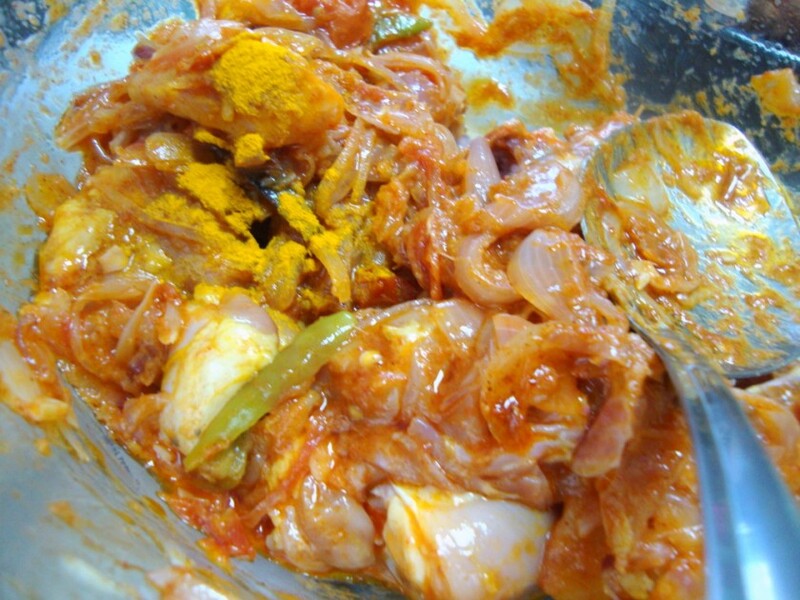 Meanwhile in a big microwave bowl, take the onions, green chilies, spices, along with ginger garlic paste. Micro for 7 mins. Stir in intervals. 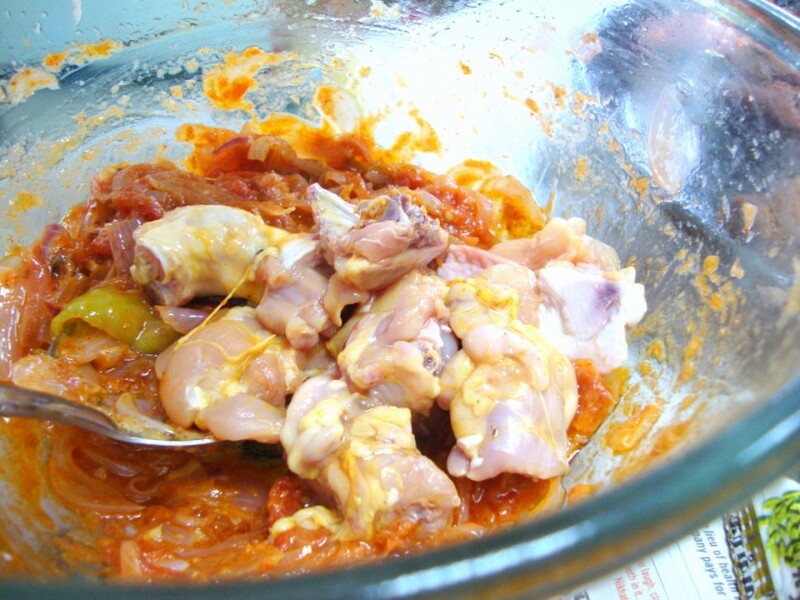 Once done, remove and add the tomatoes. Micro for 5 mins. Remove and mash well using a ladle. 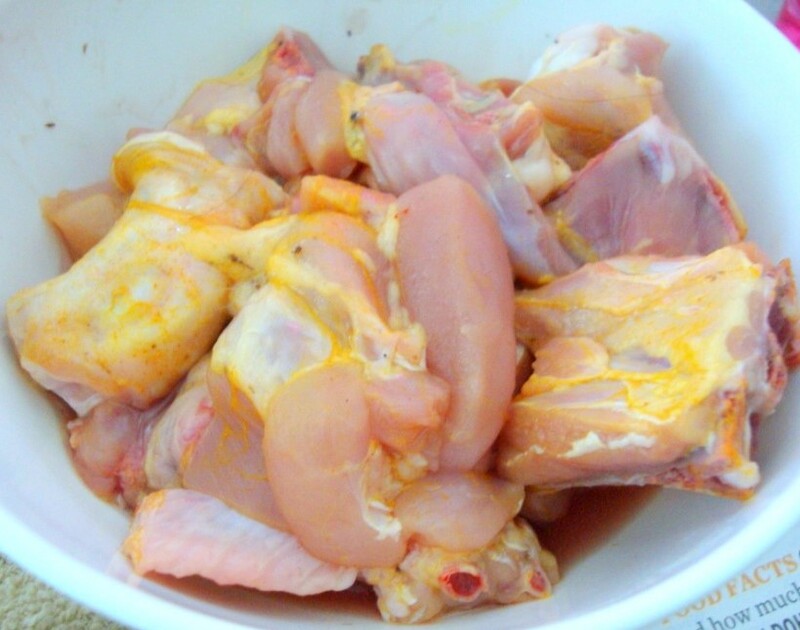 Then add red chili powder, chicken, turmeric and mix well. Micro for 5 mins. Add 4 cups of water and micro for 25 mins. First stirring is done at 10 mins. Continue stirring after next 10 mins. When you reach the final 5 mins, add the salt. Once done, remove from oven, cover with lid and keep it aside for 5 – 7 mins. 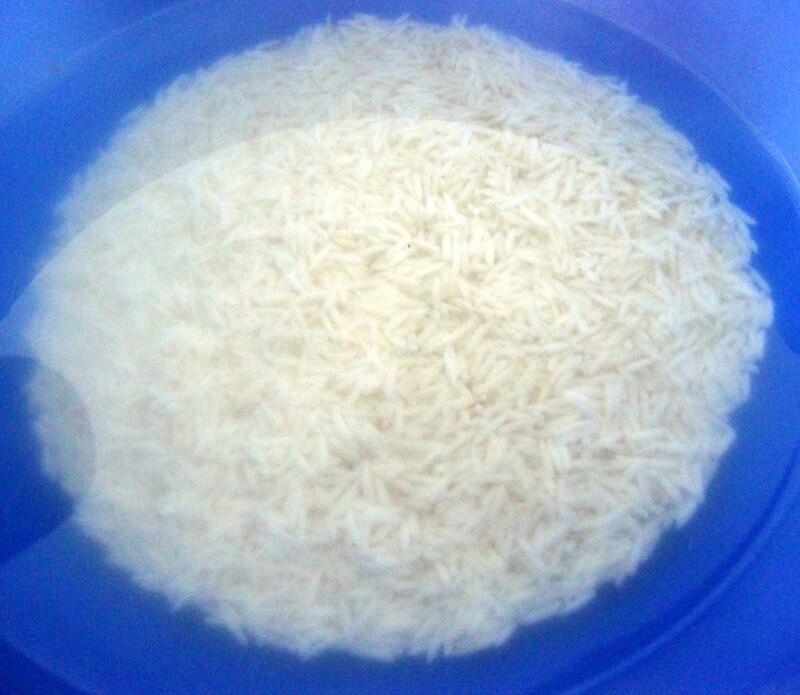 Please make sure the bowl you use is big enough to fit both the rice and chicken mix. Always add salt at the end, else proper cooking will not take place. With this amount it got perfectly cooked end of 25 mins, but if you increase, make sure you test the timing. Sending this to Smitha who is guest hosting MEC this month themed on Festival Dishes, calling from all faith and culture! Yes I am planning to send something more, hopefully so. Hope you have sent in yours! 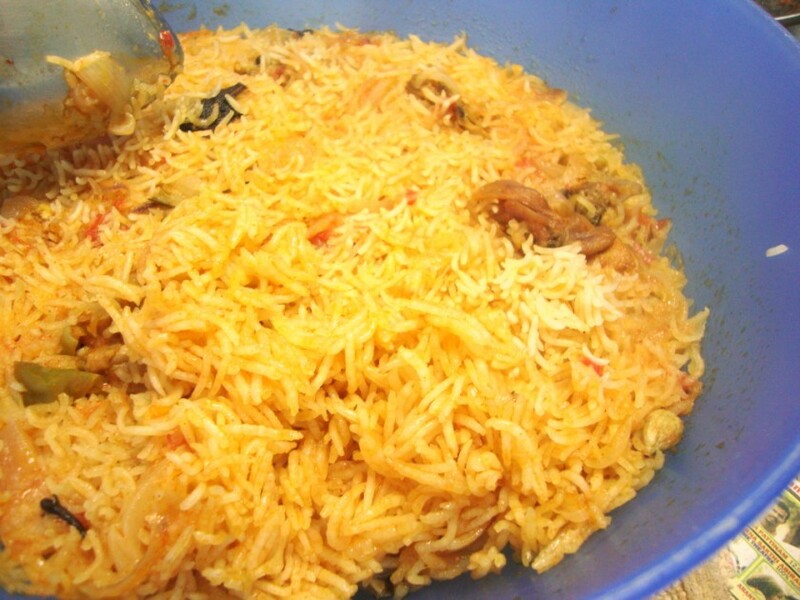 That looks so delish…u made it look so easy…to make a chicken biryani in Microwave…ahaaa!!! cool and yummy!! Even I can cook this! 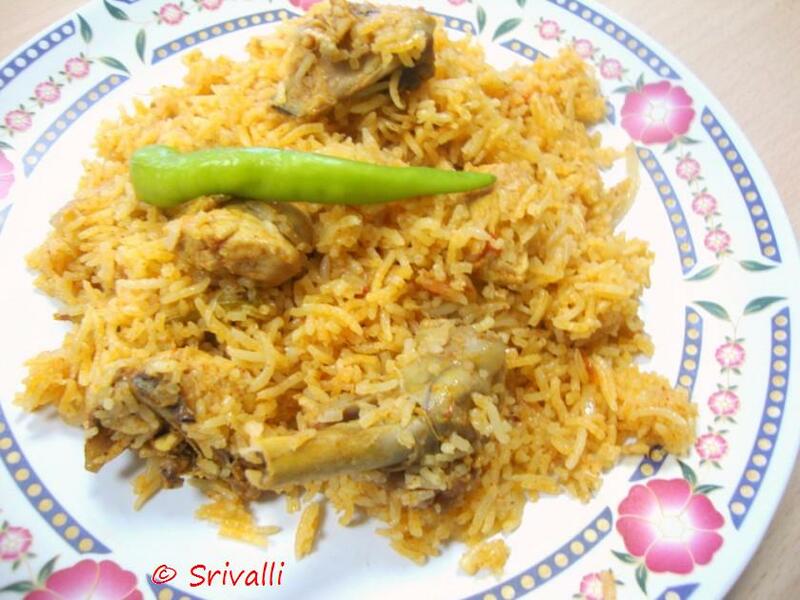 dats a very easy peasy version…it reminds me the amt of time we spend in kitchen to make it and here u cooked it in just few mins….worth a try…looks very appealing. Brilliant! Okay, easy enough for me to make too! Tried it today and was quite easy to make. But I think 4 cups of water was a bit too much! Probably 3 and 1/2 cup of water for 2 cups of rice should be good? Thank you for the feedback Sandeep I guess it depends on the rice also, including the soaking time. When I made it it was little soft but the water is needed for the chicken to be cooked. But will try with 3 &1/2 cup also and update.